Oil has made a massive contribution to human society, including its demographics and economic and social development. Its availability to society is linked to the general trend of settlement and growth. An energy surplus enables society to create a division of labour, develop more specialised individuals and grow cities. It is less than 200 years since the first commercial oil was produced in Pennsylvania. This process of development has led to the continuous discovery and depletion of oil and fossil fuels as we look to the future of ‘peak oil’ and its alternatives. The economic fluctuations of the world are highly correlated to variations in the price and availability of energy. 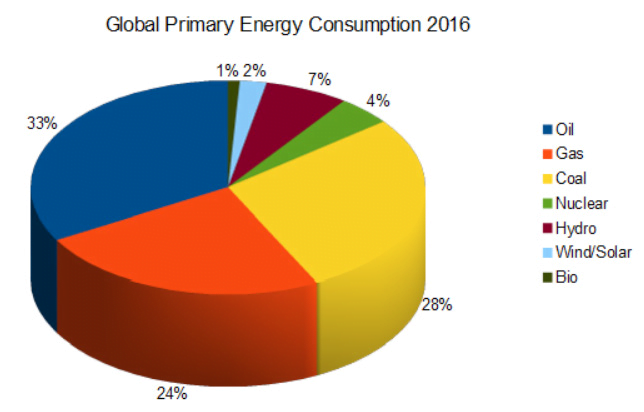 Fossil fuels still contribute to more than 75% of the total energy consumed by society. Despite widespread belief that new energy sources of renewables, such as solar, wind and hydroelectricity, are imminently due to replace fossil fuels and the expectation that energy demands from transport will be swapped to electric, our reliance on the Earth’s crust materials may go on far longer than we had hoped. Economic activity requires physical work and a steady and consistent flow of energy to be cost-efficient and unfortunately, despite huge improvements, the costs to date of renewables (aided by large government subsidies) don’t really measure up. Of course, in time, I wouldn’t ever rule out the human ability to improve and advance, but that time is not soon. Energy Returns on Energy Invested (EROEI) is the ratio between the amount of usable energy generated to the amount that is invested to attain that usable energy. In theory, this is an efficiency ratio. So, as important as the total quantity of energy available might be, there is another side to the economic growth equation. It is equally important to understand the cost of extraction and what that means to different sectors of society. It is easy to complicate this term, but put in the simplest manner, imagine the original huge discoveries in the Middle East, where there was an abundant amount of oil in the well and where very little pressure (energy) was required to capture the black gold – it was literally gushing out of the ground. Today, as wells deplete, this pressure drops significantly, and the extraction process requires water pumps to help force the oil up and the costs are correlated accordingly. Even with the ‘wonder’ introduction of shale oil, this does not help our EROEI efficiency ratio as the costs attributed to extracting through fracking are extremely high given that the process involves constant drilling with fast depleting wells. The issue of huge abundance but high costs is lost on most people. The 20th century was marred by terrible wars and unprecedented increases in population that were all influenced by a ten-fold increase in our use of energy. A large proportion of the increase in economic activity has been induced by innovation, technology and the capitalist system. The success stories include Japan, Korea and China, where the economic growth has been matched approximately one for one with an increase in energy use. As we have entered more recent times, it has become apparent that this rapid increase in energy cannot continue in the same manner. Production of conventional oil has been falling globally and many developed nations are having to import more and more energy from less developed countries. Economic growth in the OECD countries of Japan, Europe and the United States is much lower than previously and, in many cases, has ceased. There are many who suggest that while oil can continue to be produced, it is at an increasingly higher cost rate, driven mostly by a declining EROEI. This makes economic growth difficult, and if this trend continues then economies can only achieve further growth by increasing efficiency. 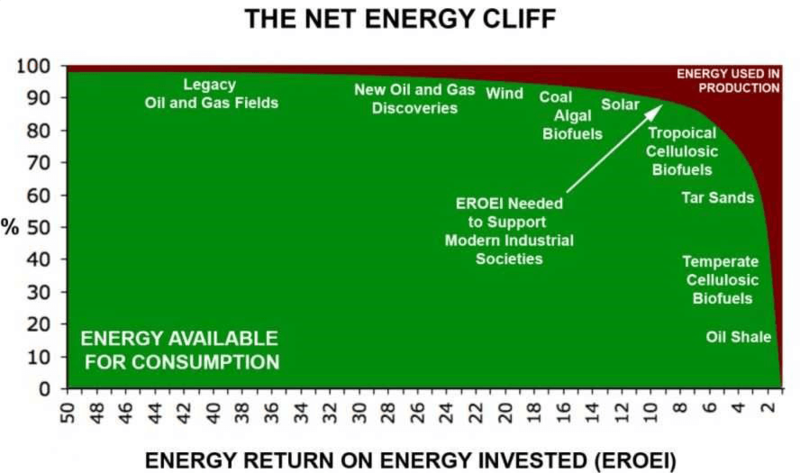 If the EROEI for oil continues to decline and alternative resources fail to provide sufficient quantities of high EROEI then we will be moving towards the ‘net energy cliff’. 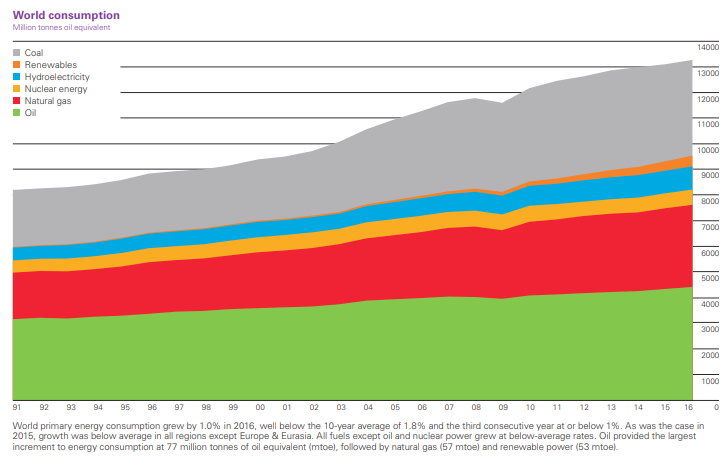 Notice the dropping EROEI along the x-axis on the chart above as you go from oil through wind, coal, solar and then shale. If the EROEI continues to decline over time, then the surplus wealth that is used to perform valuable activities within society would probably decline. Given this, we believe that declining EROEI will play an increasingly important role in our future economy and quality of life. Over the past year, we have seen a tightening of oil market supply. With political trouble across the world affecting several oil-producing nations, countries such as Venezuela are set to produce even fewer barrels of oil – some estimates reckon by up to 20%. With Libyan and Nigerian oil production also stalling and a return to sanctions between Iran and the United States, the current global situation is creating upward pressure for oil prices. In today’s world, there is no price level that satisfies both exporters and importers. Currently, exporters are becoming happier with the higher oil prices to recoup some of their losses from the slump of below $30/barrel in recent years. OPEC members have been holding back production to help deplete their current oil in storage. This has helped to lift the price, in contrast to before when they seemed to be trying to put the shale producers out of business. But this is only one side of the equation. From an oil importers’ perspective, it appears they can only bear the price at just above $70. Currently, there is a demand for 100 million barrels a day (‘MMb/d’), yet on the supply side, the industry needs to replace 4-5MMb/d production every year due to declining production in mature basins. As a result, there are talks that the United States and Russia have quietly asked for an increase in production to help stabilise the price. At the OPEC and shale executives’ Vienna conference in June 2018, the most topical discussions were on how to cooperate with each other as the price crisis last year has made them realise that the only way to achieve a balance is by working together rather than against each other. Ultimately, the only reason these two groups are meeting is that we are now at a point where a continued rise in oil prices will cause major issues for the global economy. With interest rates expected to rise across the world and oil prices spiking rapidly as they have done over the past year, the global economy will find these headwinds harder to overcome in the coming months. It is not a secret – we are running out of new oil. Oil exploration companies last year found the least amount of oil since 1940. New discoveries have fallen every year since 2014 when oversupply caused a crash that cut oil’s price by more than 50%. This crash forced many upstream producers to reduce and, in many cases, stop their spending on exploration, helping to exacerbate the lower discoveries. On top of this, it is reported that explorers are finding fewer oil resources per field and the last time a hydrocarbon company added to their reserves by the same amount that they produced was in 2006. With a lack of discovery, we must digest the fact that this could lead to severe supply shocks going forward. A whopping $450 billion a year is a number often mentioned for the needed capital expenditure (CAPEX) to replace the 6% annual well depletion. When oil prices were in the doldrums under $30/barrel a few years ago, many companies, including the majors, cut back on this essential spending. Current Situation: Oil price doubling with more to go? 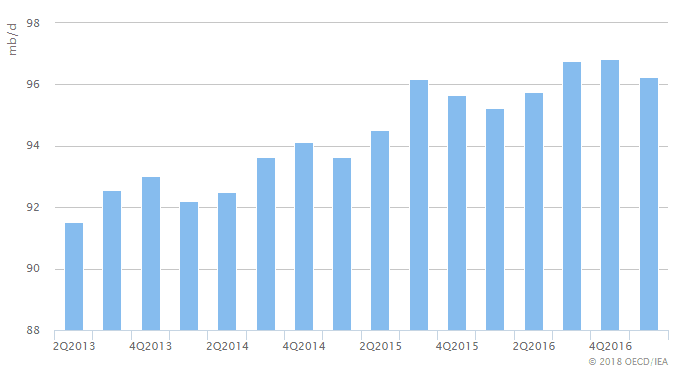 Oil recently touched over $70/barrel, a far cry from sub-$30/barrel in late 2015. At that time, most analysts were convinced that the new-found shale gas would cap oil prices below $50/barrel forever. 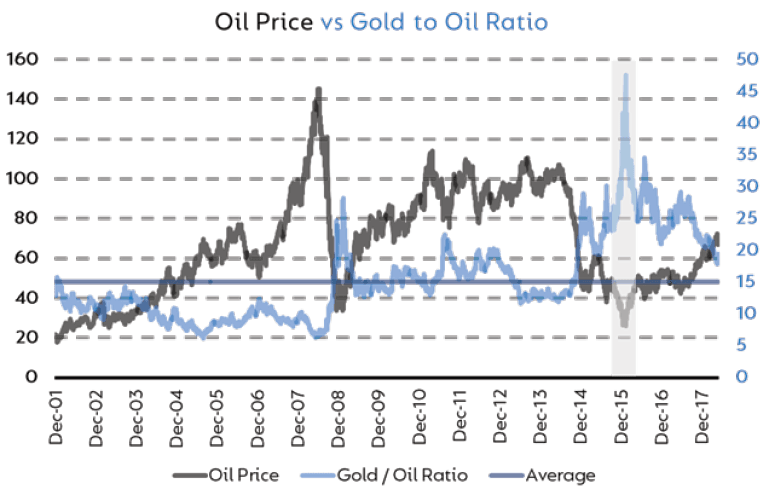 Pessimism was at a high and the gold/oil ratio had blown out to levels that had never been seen before. There is a clear fundamental story around why the situation is improving within the sector. From the supply side, there is significant stagnation after years of under-investment due to OPEC’s price crash production cuts. Even with a strengthening dollar, crude oil prices have risen more than 40% this year. Donald Trump’s decision to take the United States out of an international agreement to halt Iran’s nuclear ambitions has opened the door to a fresh wave of sanctions against the Islamic Republic and its exports. This previously happened in 2012 and the impact on supply/price was profound. If you then consider the situation in Venezuela, where the economy is collapsing along with its oil output, we have very quickly bypassed a balanced market and gone into deficit. New oil discoveries are at their lowest level since the 1960s. This has helped the demand side of the equation to catch up and we are now significantly undersupplied. It has taken several years for demand to catch up and now it will take at least the same amount of time for an oversupply situation to occur. It is important to understand that the threat of electric vehicles to the traditional combustion engine has been overblown (we currently produce almost 100 million cars globally on a yearly basis. Around 2 million are electric). We are moving in a trajectory that will see electric cars eventually overtake traditional vehicles but not for some time. The speed at which this change will occur has been overhyped by global marketing machines, with the governments leading the charge. Oil plays a significant part in the economic cycle. It induces economic growth at the right price and then eventually contributes to the bust. During recessionary periods, oil prices fall quickly as demand drops, encouraging renewed consumption and the cycle begins again. Rapid rises and falls in oil prices have a serious impact on the global economy. As prices rise, consumers’ energy bills, both personal and businesses, become a larger expense, forcing many to cut back on their discretionary spending. Soaring oil prices also see a large wealth transfer from consuming to producing economies. Since savings rates in producing nations can typically be ten times more than what they are in major oil consuming economies, there tends to be a shift in purchasing power, leading to weaker global demand. 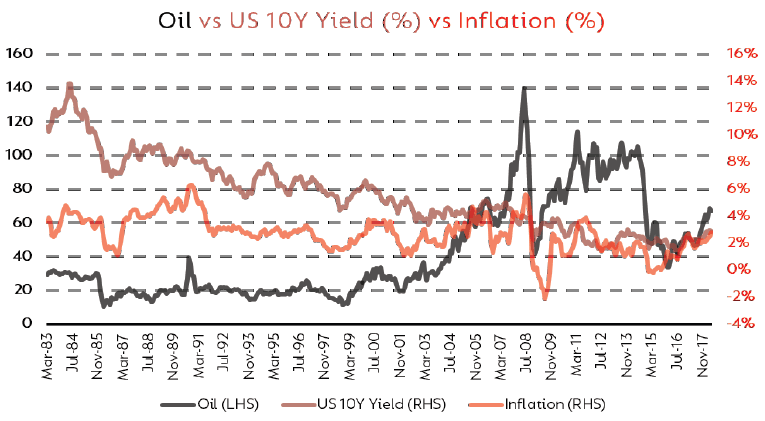 Aside from a drop-in retail demand, one of the biggest impacts that oil price shocks have on the global economy is the spike in inflation that they cause, usually accompanied by a rise in interest rates. This tends to deliver a large blow to economic growth. In 2008, we saw a very similar picture where the oil price went from $35 per barrel to just under $150 per barrel, which saw US CPI (inflation) triple. Interest rates very quickly caught up with inflation, as they always do, and ultimately had a significant impact on the mortgage market. We should be concerned by the chart below which shows that every time there has been a rapid doubling of the oil price, a recession is not far behind. Large importing countries, such as India, are highly geared to the oil price and we are already starting to see the impact of high prices taking effect. Inflation is starting to rise, and as a result, the bond yields are rising with hikes in interest rates. On the other hand, Russia, as a producer, is seeing a substantial improvement in its outlook as oil prices rise; its GDP is turning up, and its budget shrinking. Oil has been a crucial element of human development and its reliance is not going away any time soon despite the widespread belief that this will happen. The EROEI for oil, while declining, is still significantly better than all the alternatives, at this time. Despite the current demand/supply of close to 100 million barrels per day, the float that determines the clearing price for oil is probably less than 3 million barrels/day. That float is currently being squeezed by increased demand coupled with supply shocks and the recent lack of CAPEX. The oil price has risen by some 130% since late 2016 and may be on a continued upward trajectory into 2019. 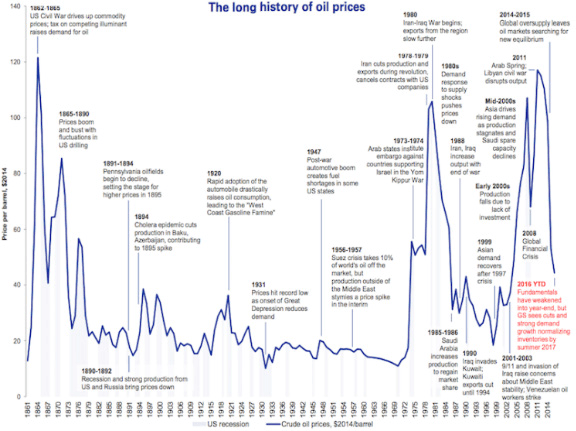 Higher oil prices rising at this speed and magnitude often contribute to, and precede, recessions. High oil prices benefit large exporters, such as Russia, and hurt large importers, like India, China and Japan, and shift global dynamics greatly. Donald Trump,economics,energy,global economy,how important is oil?,how will sanctions impact oil?,innovation,Iran,oil,OPEC,Saudi Arabia,Shale,Trump,US,what is the most important asset?,what is the oil price?